This is the game’s intro sequence. The controls are not as responsive as on might expect, the A button is used to enter and exit fright ’em spots – glowing dots on an object indicating that it can be possessed. The B button is responsible for the kick and spinning kick attacks and finally, the C button is used to access the power up menu. But there’s a reason why the controls are not so responsive: the levels in this game are all rooms of a house, being hard to navigate, since they tend to have a cramped nature. On top of that, objects that can be possessed are close to each other, and if the main character moved too fast it would e hard to select which object to “enter”. Controlling or “possessing” objects is the gameplay’s core. They cause a poltergeist event to take place, spooking a member of the Sardini family. As expected from a ghost, Polterguy is invisible, and only the events can be seen by the people that inhabit the house. After entering and exiting an object, it starts to shake, catching the attention of a unlucky family member. If he/she is close enough to the object, the event manifests itself, and range from corpses inside the bathtub, skeletons appearing next to doors to jumping lampshades, exploding paintings, monsters coming out of the closet – you get the idea. There is a lot of object animations in this game, some of them can be controlled temporally, like chainsaws and dish washing machines. Some poltergeist events can be controlled, like this ship. It sounds simple but it isn’t, because there is a lot a variables to consider. And here’s where the gameplay shows its depth: Polterguy can queue any number of poltergeist events by entering and exiting objects, although it takes a small amount of time for these events to take place. Time is something that the player can’t afford because the energy bar, named “ecto bar” depletes with time. It can only be partially refilled after a Sardini gets scared away from the room. So, there’s strategy involved, requiring the player to balance the creation of these phantasmagoric events with the time it takes to deplete the energy bar. Furthermore, there are other things to consider such as the place where the event is going to manifest itself, to efficiently make a person be scared away towards one of the house’s exits. When the energy bar reaches zero, the main character is transported to a dungeon, where the hazards and other enemies such as punching arms that come out of the walls and ground, bats and bouncing skulls can take away Polterguy’s health. It’s the only place in the game where he can die. 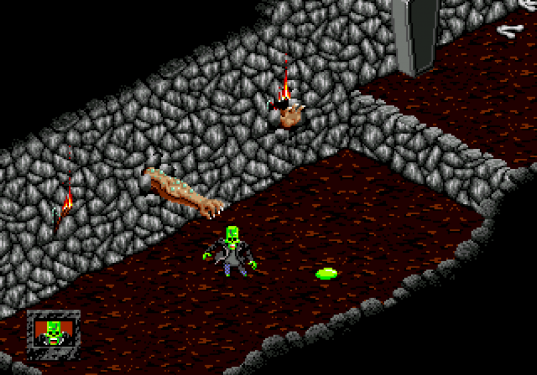 To escape from dungeons, the player has to guide the ghost to collect ecto drops that fall into the ground. Collecting these drops will eventually reveal the dungeon’s exit, indicated by a bright spot on the ground. Dungeons are not only a an endurance test because it’s where the power-ups can be found. These dungeons are so dangerous that can even kill a ghost. These power-ups are a great addition to the game, because without them, it would be extremely hard. They go from creating phantasmagoric explosions, temporary possession of a family member to completely re-filling the ecto bar and adding a bowl of dog food to distract the dog. It is the only living being of the family that can see you and it’s bark depletes the energy bar and can summon two monsters that attack the main character, taking away large chunks of energy on a single hit, so it’s best to avoid it. 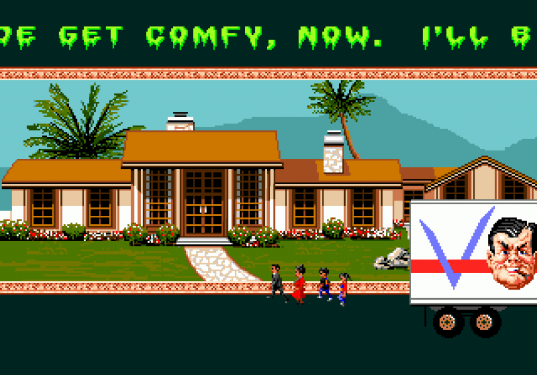 The game progresses by expelling all family members from their house, making them move to a new and bigger one. The ghost has to scare them out of this new house again, making them move to another one, starting the phantasmagoric cycle all over again. The Sardini’s always move to a bigger house. Animations on this game are great, the characters have well executed animation loops and there are tons of different animated objects. 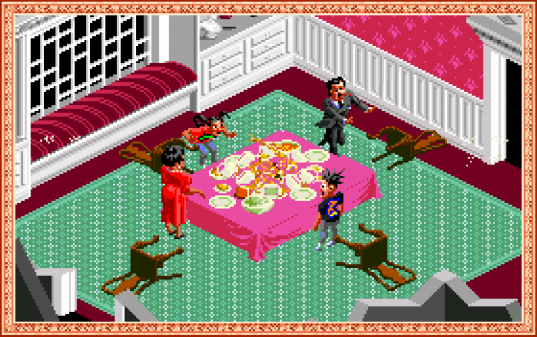 Graphics are isometric with a stylized pixel art with lots of detail, making the levels of the game look like a believable house and not a game level, with different dinning rooms, bathrooms and kitchens on each house. Music is OK, and fits well with the game’s ghostly theme. The songs always feature a theremin and pipe organ instruments and are not much special. The sound effects, on the other hand, are great, specially for the Sega Genesis. Some of them are also featured in the game Desert Strike, created by the same company. There are some flaws in the game, mostly caused by the isometric view that some times can hide an ecto drop behind an object, so the player has to spend some time to find it. It’s specially annoying when the last person is scared out of the house, and it’s necessary to pick up all the droplets to advance to the next level, but it’s hidden somewhere behind the furniture. 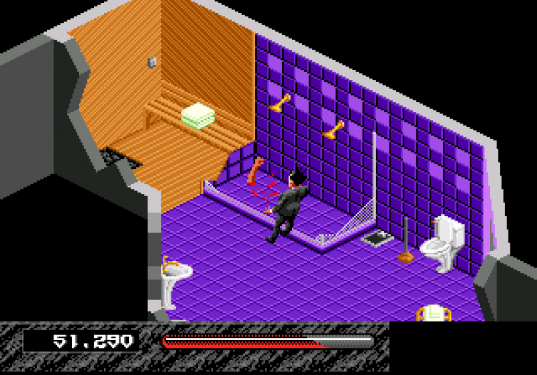 To avoid that, the player has to pay attention on the locations where the person got spooked, because that’s where the drops will appear after they leave the room. Another problem is that it’s hard to know exactly where Polterguy will land after a jump. There is no shadow to indicate where he will land, and inside the dungeons, it’s not hard to land on a bat or a punching arm that breaks out of the wall. 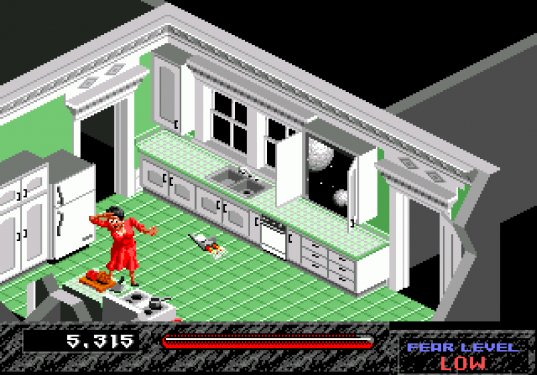 The player has to remember the locations where the person got spooked to effectively collect all the ecto drops. Additionally, for the players that are after a long game, this might come as a disappointment: there are only 4 levels in this game and it can be beaten in a little less than a couple of hours. Tough, it doesn’t mean it’s a walk in the park, since the game’s mechanic has enough depth and various objects to ‘explore’. Moreover, at the end of the game, players will feel a high difficulty spike on the final boss battle. Even with some problems, Haunting Starring Polterguy is a great short game that offers a unique engaging experience, it contains humor mixed with terror combined with an action/strategy gameplay, being fun to play even after so many years.